If your organization needs to collect data via your website in order to automatically update your DonorPerfect Online (DPO) records; or conversely, if you need to display DPO information through your website, our API-XML web service may be the solution you are looking for. This set of API tools allows your web developer to create web pages that can add or update in your DPO system in real-time. 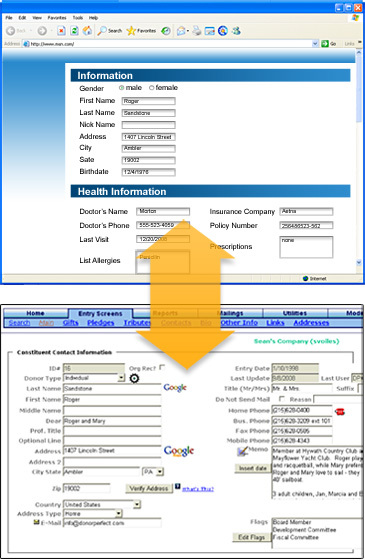 We also provide API tools for retrieving donor information that can be displayed on a web page. Application Programming Interface (API) is a technology that facilitates exchanging data between two or more different applications. the technology also includes features that provide for interoperability and data sharing between multiple applications and different platforms. these are important features when developing new, or upgrading existing, distributed systems. This technology is a way to achieve the total cross-platform consistency that is a goal of open systems. How does the Online API-XML interface work? The Online API-XML interface allows DPO to be an intelligent “back-door” to your website. The integration is completely the same look and feel of your website, but the fields of information are tied directly to DPO. this all takes place “behind the scenes,” and in real time, ensuring the most up-to-date and consistent data is always available in DPO an d on your website. What technical skills do I need to use this service? These tools are designed to be used by web programmers with knowledge of API-XML and a server-side scripting language such as ASP, Pearl, PHP or an equivalent. Some understanding of DPO is also desirable . We do provide easy-to-follow instructions, as well as sample web pages and templates for your developer. In addition, professional consulting is available on an hourly basis. Is this the only way to provide integration with your website? Certainly not. In addition to the Online API-XML interface, DPO offers several other solutions for common needs such as collecting online donations or integrating with other web-based services. We encourage you to discuss your specific needs with your regional account manager.